For the first time in a while, I got my sewing machine out over the weekend. I made a dog bandana for the family dog, Patrick. 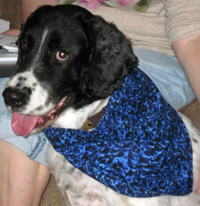 His Royal Furriness is a black and white field Springer spaniel, ten years old, and very active. And he loves to wear bandanas. Seriously! Only the one I made him was WAY too big. Hence the fail of this project. I got the fabric at Wal-Mart and had a nice conversation with the lady working in the fabric and sewing section. She apparently has three little dogs that she sews for, too. 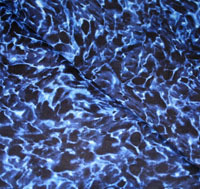 I like the blue and black cotton fabric that resembles the bottom of a pool. It looked nice on Patrick, and I have some left, so I will try again using this fabric. Click here for a link to the site I got my directions from. I believe I should follow them more carefully next time. Still, I’m counting this only as a partial fail because I did manage to sew something that resembled what it should be. Also, I was able to follow the directions, more or less. So, I did have some success. And my seams weren’t horrible, either. 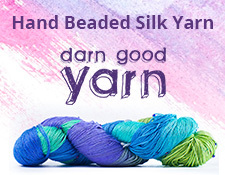 Next time, I need to pay more attention to the size I need to make. Patrick wears a 19 inch collar, so I need to adjust for that next time. I also have some other ideas for geeky dog bandanas once I get the pattern down. Until next time, I will try again, and keep on trying until I get it right. Anyone have a really big dog that would like a dog bandana? First one to respond gets it. Just leave me a comment, and we’ll work out the details.